In the mid- to late-1990's, the big publishers like Random House, Harper and Time Warner started selling unabridged audios. Whereas previously they had confined themselves to abridged productions, the advent of compact discs enabled them to sell unabridged recordings in retail packages that were less bulky and more economical than the old cassettes. As a way of cutting down on the costs of these full-length programs, they contracted for co-publications with some of the "library only" companies. Books On Tape, for instance, would produce the recording and distribute it in the library market, and Harper or Random House would repackage the recording for distribution in retail stores. This worked out well for everybody, and in one instance it turned out to have a considerable impact on my narration career. In the fall of 1999 I was directing a production of Arthur Miller's The Price for Everyman Theatre in Baltimore. We were three days from opening when it became clear that the show "wasn't happening," as we say in the business. The leading actor was suffering from a horrible case of nerves and couldn't master his lines or his blocking. We searched for someone to replace him but came up empty, so I had to step in and do the part with script in hand. With all the stress I developed a ferocious cold which I only managed to overcome with heavy doses of medication. In addition, I had to cancel a ski vacation to Taos, New Mexico that Tanya and I had long been planning to celebrate her birthday. She ended up going alone, a sorry turn of affairs that has never been forgotten and is invariably dredged up whenever I try to take on more than I can handle. In the midst of this crisis, on a Wednesday evening, I got a phone call from Books On Tape. 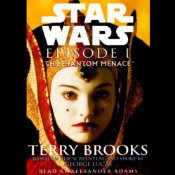 They had just finished recording Terry Brooks' novelization of the first installment in the new Star Wars trilogy, The Phantom Menace, but evidently no one had told them that narration alone wasn't sufficient: LucasFilm expected a full-blown production with music and sound effects. They had to start all over with two weeks to go before the release date, and Random House was taking over production. Was I available to go immediately into a Washington, D.C. studio and begin recording? I said that apart from the fact that I needed to be in Baltimore at six o'clock every evening and had a terrible cold, I was willing, so we set up the first session for that Friday morning. Friday came around and things immediately got off to a bad start. A director from Random House was flying down from New York to take charge of the process, so I offered to pick him up at the airport and drive him to studio. Well, I tried to pick him up but I couldn't find him anywhere. Figuring that he must have taken a cab, and worried that I would be late for the first session, I headed to the recording studio only to discover that he wasn't there. I sat around for a while with two bewildered voiceover engineers who were looking at this enormous, four-hundred page script and saying, "We're gonna record all this?" Finally the phone rang and it was the irate director who was still waiting at the airport. One of the engineers told how to find a cab and gave him the address of the studio. Thanks to my bungling he arrived in something of a state, and following a brief discussion with the engineers he came into the booth and announced that he knew how I was "used to working" but that we were going to have to do things "very differently." I surmised what that meant: I was one of that lowly species called "home narrator" who worked without supervision and supposedly rattled off a book without much thought for style and content. I got the impression he felt it would take a lot of effort on his part to draw out a reading of any skill or sensitivity. This wasn't particularly encouraging, but I figured fifteen years of experience had to count for something and somebody thought I could do it, so I steeled myself for a rough ride. The biggest challenge came when I had to imitate the voices of the principle performers, including the colorful cast of aliens. But since the film was such a huge deal and everything surrounding it was top secret, all we were given was the trailer, from which I had to extrapolate a whole novel's worth of characters and plot line. A brief glimpse of Jar Jar Binks, a couple of shouts from Liam Neeson, and some garbled alien chatter were about all I had to go on. But there was no time to waste, so we plunged in. The first page, describing the desolate landscape of Tatooine, took about half an hour and seven takes. There were a lot of exasperated sighs and mutters from the control room. Apparently I wasn't "painting the picture." I was doped up on antihistamines and thinking about the enormous role I had to perform for the first time that night with only two days of rehearsal, so frankly I wasn't in the mood to argue and was just trying to go with the flow. We pressed on and finally got to some dialogue passages, and the mood improved a little. After I managed to pull off a couple of alien voices with some aplomb, the sailing got fairly smooth. We broke for lunch and over catered sandwiches the director admitted that I "wasn't too bad at this." That was a relief. Four days later it was "in the can" and there were smiles all around. The voice track was shipped off to New York to be dolled up with music and foley, and that was that. It turned out pretty well, but I figured that was the last I'd hear from George Lucas or Random House. But these were enough to raise my profile with New York producers, and thereafter I travelled to the Big Apple about six times a year for one project or another. It was a huge boost to my freelance career, as well as my income, and led to some very fun projects--more about which tomorrow.